CHAIRS. oh, and Bear. Things are getting pretty fuzzy around here, but I figure that as long as our house is still fit for the internets, it can’t be that bad. And if anything isn’t fit for the internet, it’s that pile of stuff on top of shelf that I keep meaning to take downstairs. Oops. But back to the chairs. It begins with a frost. Two heavy, wooden chairs with perfectly intact rush seats (they look recently repaired to me). At first it seemed a bit odd that the seats were wood and the rest was painted white, but, for $6.99 each (just over two pie plates!) I didn’t hesitate much. My mom had suggested antique chairs a while back, but I couldn’t get over the idea of clashy woods (the beech table is hardly a match for old oak). But white! White could work! I figured that if they didn’t work around the table, I could use them in the bedroom. Or take them back, since Goodwill apparently has a ten-day return policy. 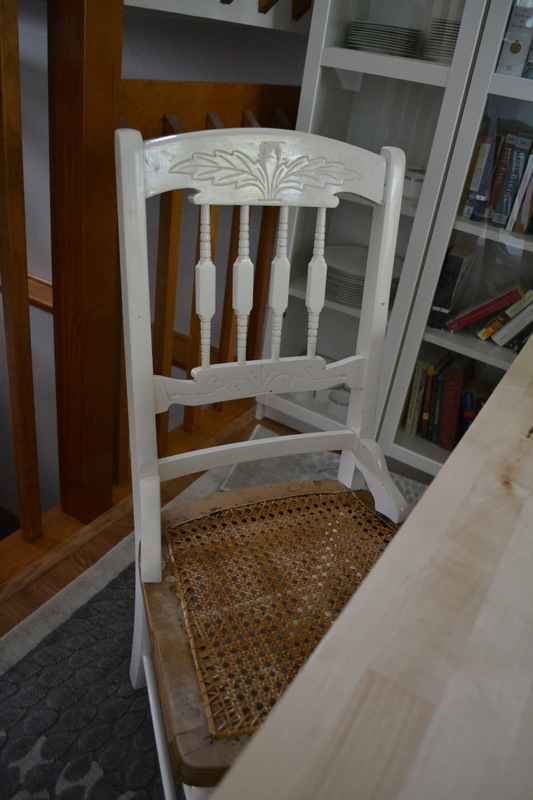 The next day, I convinced Ricky to join me on a sojourn to the thrift stores of Loveland, including the aptly-named “Itchy’s Flea Market.” At our first stop, the Habitat for Humanity ReStore, I saw four press-back oak chairs and a table. Painted white, and with the apparent skill of a toddler with a broom and a gallon of paint. But I didn’t need a table anyway. So we kept looking. Then we went home. Then we went back. 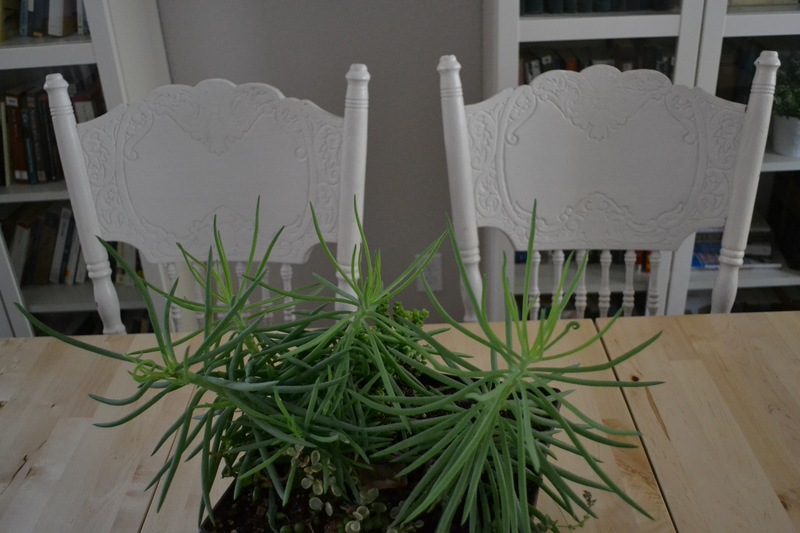 Because my Craigslist searches revealed that $55 for four chairs and a table—even if we didn’t need the table—was hard to beat. So we took the chairs and immediately re-donated the huge, round oak table (we had no way to move it, nowhere to put it, and it had been painted in the same half-hearted fashion as the chairs). In context, the paint job on the chairs doesn’t look as bad. The seats are unpainted, which, oddly, makes them blend quite well with the other two. I like that they don’t all match; I even like the unexpected imbalance of two smaller chairs at the head and foot of the table rather than two large chairs and four small ones. It’s kind of whimsical. 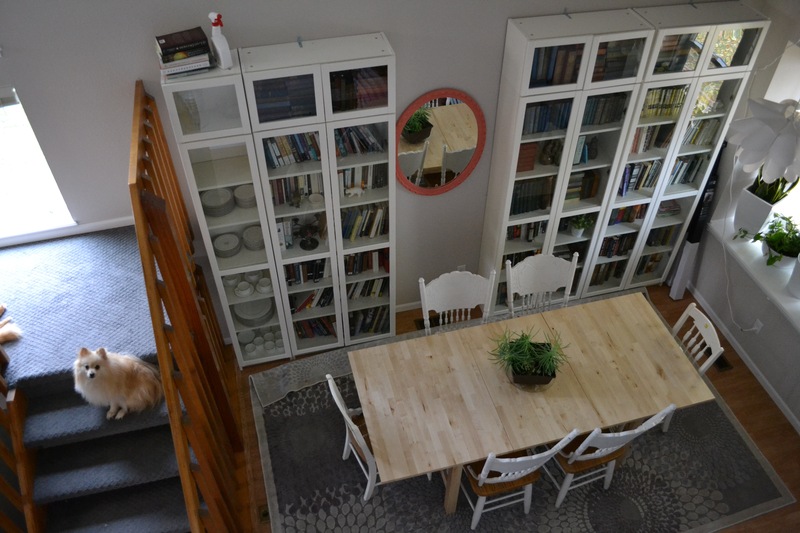 I definitely like the white better than oak; it makes them look a bit more modern, but not so modern that our space reverts to looking like an Ikea display. I may repaint them with a more even coat of white when I get around to fixing several loose spindles, or maybe not. Six solid wood chairs: $6.99 +$6.99 +$55 – one round oak table. Less than the cost of one chair from any of the other options I was considering. And so much more interesting. oh these chairs are so much better! i also have some clashy wood because i got some amazing mid-century chairs for FREE. they need reuphostering but they’re very classy. and not the same wood as my table. now covered with a tablecloth. and cat fur. oooh, fun. I love reupholstering. Ikea fabric could go well with mid-century.